Welcome to Online Turf. We supply and deliver turf all over the UK with a next-day delivery service. 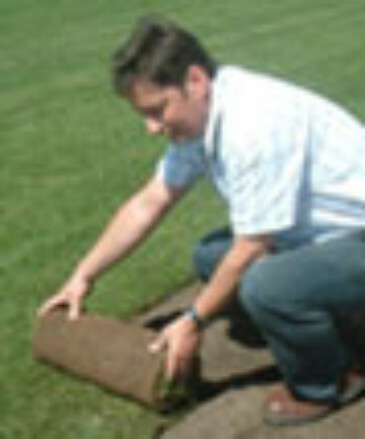 We can recommend turf installers for most postcode areas, if you are unable to install the turf yourself. These turf installers will offer a professional and quality service when they are laying either of our two varieties of turf, Stadium and Rye Gold. Both Stadium and Rye Gold turf can be viewed on our turfcam, letting you see the appearance of our turf on any given day. Please feel free to also visit our feedback page to view our customers’ comments on Online Turf and the service we provide. We recommend that turf installers lay the turf within 48 of receiving it in order to ensure a healthy lawn. We deliver freshly lifted turf to you, normally within 24 hours during the working week or at a time requested by yourself. We provide a weed-free quality guarantee so you can be confident that you're buying top quality turf.